When I intro­duce myself in meet­ings, at con­fer­ences and oth­er events I often start by say­ing that I’ll offer a prize to any­one with a longer job title than mine, as the Council’s Envir­on­ment, Trans­port and Future City Man­ager I’m lucky enough to work in a diverse team full of people with dif­fer­ent back­grounds, interests and pas­sions. This is a pretty excit­ing place to be from my per­spect­ive. It means that on a day to day basis we are increas­ingly able to think bey­ond our own silos to see how we can do the one thing that drives us all — mak­ing the city a bet­ter place. I’m reflect­ing on this after a meet­ing a couple of weeks ago with the RNIB (Roy­al Nation­al Insti­tute of Blind People). Back in August 2016 the Depart­ment for Trans­port issued a ‘Cooper­at­ive Intel­li­gent Trans­port Sys­tems’ fund­ing call, seek­ing to allow coun­cils to cap­it­al­ise on emer­ging tech­no­lo­gies and deliv­er bet­ter jour­neys. 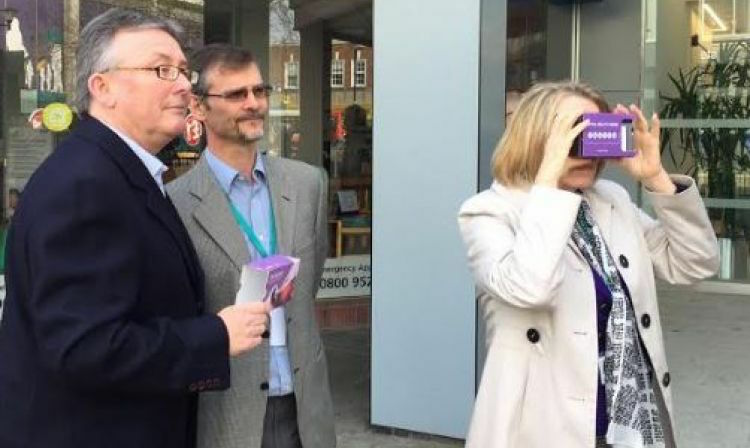 We put a bid in for some­thing pretty innov­at­ive — we wanted to cre­ate a vir­tu­al real­ity mod­el of the city centre and use an amaz­ing new app developed by the RNIB to help us under­stand how blind and par­tially sighted people nav­ig­ate our city centre — the idea is that if we under­stand this we can do two things: 1. we can see how we might plan infra­struc­ture dif­fer­ently if we under­stood how sim­ple tweaks could improve peoples exper­i­ence and 2. we could install a net­work of beacons that would ping sig­nals to Smart phones to help people nav­ig­ate their jour­ney. A couple of weeks ago I tried out the RNIB app for myself. It was imme­di­ately obvi­ous how much poten­tial this pro­ject has for improv­ing access­ib­il­ity in the city centre. But, it’s also sparked enthu­si­asm from oth­ers. For example, one of the team found an example of one city using beacons to ping mes­sages that allow you to walk along the road and see what it would’ve looked like 500 years ago.… Another indi­vidu­al from a loc­al digit­al com­pany has offered to get involved build­ing the vir­tu­al real­ity mod­el in their own time. Work­ing across the Envir­on­ment, Trans­port and Future city worlds means that ‘sparks’ like this are hap­pen­ing more and more often. It’s excit­ing!